Over the first half of 2017, Insight examined many of the trends dominating the financial industry and making headlines. However, while headlines tell part of the story, nothing quite captures the movements of the market like data. Here, our panel of FactSet experts have selected the graphs and charts most evocative of the trends driving 2017 so far. Read on for an unadulterated look at the data behind the biggest stories of the year. According to The Conference Board, consumer confidence reached a 16-year high in March 2017. The increase over the last several months appears to be driven largely by strong performance in the stock market and post-election enthusiasm. However, rising sentiment in the first half of the year was not matched by faster consumer spending growth, with retail sales growth underperforming in Q1 and Q2. We did see retail sales jump up in July, in sync with a jump in confidence, but we will have to wait to see whether this pattern holds for the remainder of the year. Following the largely commodity fueled jump in prices in January, both monthly CPI and PCE price indices have remained essentially flat in recent months. On a year-over-year basis, we are seeing steady declines in the growth rates for both measures, including their core counterparts. Given tightening labor markets, the Fed is keeping an eye on this data as part of their dual mandate to foster economic conditions that achieve both stable prices and maximum sustainable employment. Analysts surveyed by FactSet are predicting one more rate hike this year in Q4, in line with what is being predicted by futures prices. The continuing trend away from traditional retail establishments and toward online shopping is having a significant impact on retail company performance. According to FactSet Market Indices, the total return for U.S. food retail companies is down 15.2% YTD and apparel/footwear retailers are down 12.7%. On the other hand, the FactSet index for internet retail companies is up 30.4% YTD. 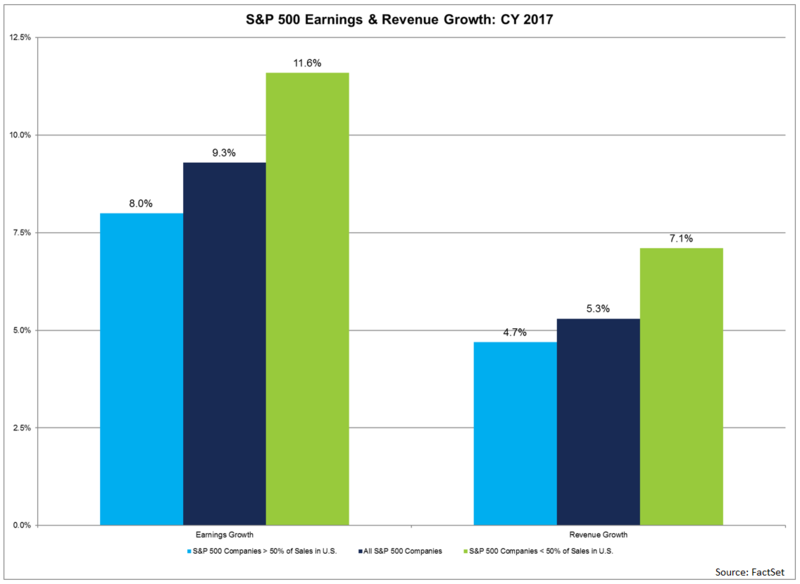 Companies in the S&P 500 with more global revenue exposure are projected to report higher earnings and revenue growth in 2017 relative to companies in the index with less global revenue exposure. At the sector level, the Information Technology and Energy sectors are expected to be the largest contributors to earnings and revenue growth in 2017 for companies with higher global revenue exposure. Thus, the market will likely continue to watch for any significant changes in oil prices, foreign exchange rates, and global GDP growth in the second half of 2017 that could alter these expected earnings and revenue growth rates for the full year. The spread between the two year and 10 year points on the yield curve is an indicator for the overall health of the economy. A larger spread indicates a steeper curve and can be interpreted to mean that markets reflect term structure appropriately. A narrow (or negative spread) indicates that investors are demanding more yield to lend for shorter horizons, which can be interpreted to mean that risks are seen in the economy over the short to intermediate term. A negative spread, also known as an inverted yield curve, front runs a recession. The 10-year Treasury is typically viewed as a bellwether globally. Looking back at the past two years, the US 10 year appears to be range bound; some of this is supply/demand, some of it is chase for yield, and some of it is uncertainty across the US economy given an uncertain fiscal policy outlook. The UK has recovered somewhat after a strong leg down, and Brexit uncertainties abound against an inflationary outlook. The German curve appears to be on an upward trend, which fits with a continued strong macroeconomic outlook in the eurozone. The dominant narrative through most of 2017 so far has been about protectionism: countries clamping down on outsiders buying up their companies. We have seen this in all major regions with large deals cancelled due to government pressures, and given the political climate over the last year, this does not come as a surprise. 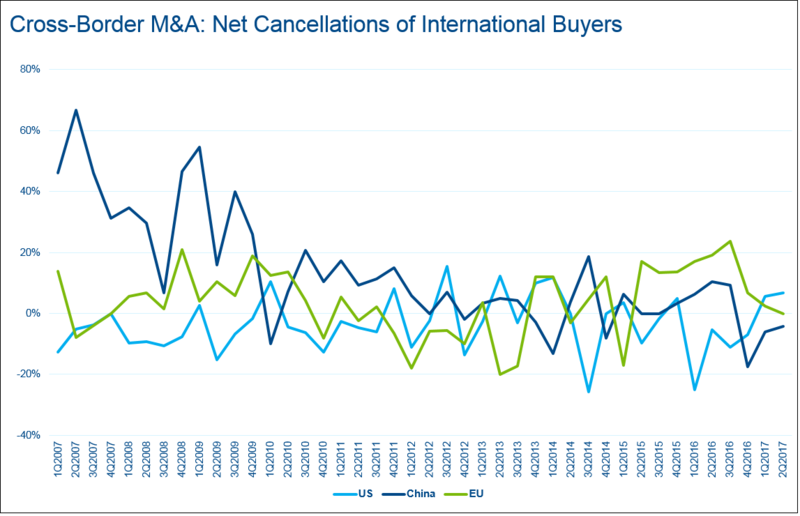 For M&A, without specifically researching and classifying every deal, we can still infer a protectionist trend by looking at cross-border cancellations and calculating the net percent of international buyers that have their deals cancelled relative to international sellers. In other words, if a country has a higher rate of cancelled deals for international buyers then there is an argument to that it prefers domestic buyers (i.e., a more protectionist stance). Active management, as represented by mutual fund assets, is barely growing, while passively managed ETFs are growing at a 21.4% annualized rate. 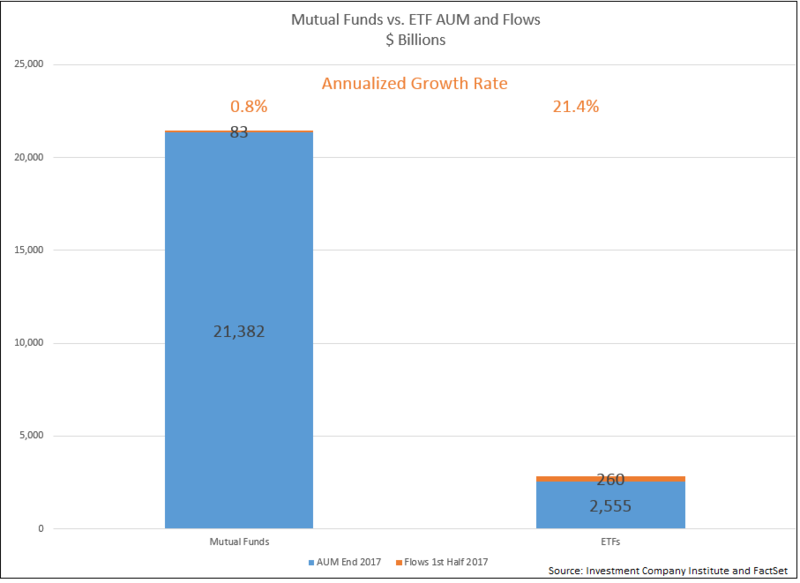 Mutual fund asset levels are eight times higher than ETF assets, but ETFs took in more than three times the net inflows in the first half of 2017. Active management may actually be continuing to shrink even though mutual fund assets grew a tiny bit between January and June, because of the growth of index mutual funds. According to the Investment Company Institute 2017 Fact Book, 19.3 percent of overall mutual fund market share in 2016 was in index funds. More starkly, according to the ICI, actively managed mutual funds lost assets to outflows in 2014, 2015, and 2016, while index mutual funds took in new investment. Our experts weigh in on the stories will define 2019. A selection of our best performing stories from 2018! In this video, our experts examine the trends of 2018 and discuss what they mean for the future of financial technology.